Balsam, one of the main ingredients of incense used in the Temple, growing at Guy Ehrlich’s farm in the Jordan River Valley. The balsam tree, Commiphora gileadensis, used to grow on the shores of the Dead Sea. The ancient Jews were the only ones who knew how to cultivate it. They started to grow the afarsimon when the Queen of Sheba gave some plants to King Solomon. They continued to farm it until the fall of the Roman Empire, more than 1200 years later. Its pure oil was used to anoint the Kings of Israel. It was also one of the ingredients of the incense used in the Temple. It was so popular for perfume and cosmetics among the Romans, it became the second largest industry in Judea. The destruction of the Temple and subsequent exile of Jews caused the balsam industry to go into decline. By the sixth century, it had disappeared. By the twentieth century, the only true balsam plants in the world grew wild in Yemen, Oman, and Saudi Arabia. The secrets of its cultivation and use were lost, maybe forever. Guy Ehrlich decided he would revive the balsam industry. Whatever he grew needed to be commercially viable. The afarsimon, he hoped, would fill that purpose. It could be used as an essential oil, as a medication, and for perfume and cosmetics. When the Third Temple is built, it will be needed to make incense again. But first, he had to find the plant. He learned that some plants had been smuggled to Israel from Saudia Arabia and were at the Botanical Garden in Jerusalem. Unfortunately the climate of Jerusalem is too cold for the desert-loving plants. Fortunately, before all the afarsimon died, the garden sent some to Dr. Elaine Solowey, director of the Center for Sustainable Agriculture at Kibbutz Ketura. Guy convinced Elaine to give him some of her C. gileadensis. It thrived on his land. Chemical analysis of residue in ancient pottery demonstrates this plant is identical to one used in antiquity. But they cannot be 100% sure. Until that tiny doubt is removed, he will continue to cultivate his plants. His farm now has about five thousand balsam plants. Before he moved to Almog, Guy had been a journalist. He knew very little about business. So he turned to the MATI, the government small business center, for help in turning his small stand of trees into a money-making venture. They told him he was crazy—he would never make a living growing balsam. He should focus on tourism by establishing an educational visitors’ center. He would continue to grow the plant he loved, and teach tourists and students about its history and uses. With the help of MATI, he established his tourism venture. at his Balm of Gilead Farm. He also expanded his agricultural aspirations. Why stop at growing only one ingredient of the incense? He began gathering more medical and perfume plants that had been named in the Bible. Today his Balm of Gilead Farm has the largest private collection of Biblical plants in the world. Because he cultivates Biblical herbs, Guy keeps in close touch with Temple activists. He has consulted with Rabbi Yehuda Glick, a member of the Knesset who promotes Jewish visits to the Temple Mount, the holiest place in the world. Jews. He also works with Rabbi Yisrael Ariel, the founder of the Temple Institute. Rabbi Ariel works with a team of scholars and craftspeople to research and reproduce instruments and furnishings of the Temple. They also want to make sure the raw materials of the incense will be available when the Temple is rebuilt. We met Guy at the Balm of Gilead Farm in Almog when we toured the Jordan River Valley with One Israel Fund last month. After he reviewed the history of balsam and of his farm, he walked over to a stand of bushy trees, and pulled down a branch. With a small knife, he peeled a small strip of bark and made a shallow cut in the wood. Sap bubbled up. He gathered a drop of it with his finger, and then applied a tiny amount to the wrist of everyone who wanted to smell it. All fifty us wanted a sniff, so he ended up repeating the procedure with two more thin branches. That was a lot of sap from such a small cuts. The aroma of the raw balsam is light and pleasant, with a slight lemony tang. To produce oil from this sap, he needs to gather 150 Kg of plant material to distill 250 cc of the essential oil. Thus, it requires about 330 pounds of raw balsam to produce a cup of oil. No wonder it was so valuable. Four years ago an American company looking for a good source of rare essential oils offered to partner with him. They invested a substantial amount of money in his venture. Unfortunately, they never received a return on their investment. Under pressure from the Boycott, Divest, Sanction (BDS) movement, the company withdrew its support. As a result, Guy had to let his Palestinian and Jewish workers go. He now relies on volunteer workers to help maintain the Balm of Gilead farm. We’ve heard the same story before, at other small businesses in Judea and Shomron. Under pressure from BDS, foreign businesses withdraw their support. With a decreased customer base, the local companies are forced to downsize and let employees go. BDS supporters say they are acting to help Palestinians. I doubt that the thousand plus Palestinians who have lost jobs at Soda Stream, Havat Sde Bar, Balm of Gilead Farm, and other places, think they have been helped. 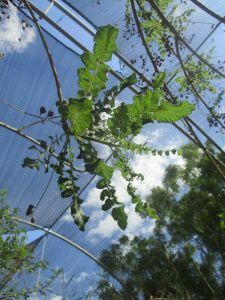 Frankincense growing at Balm of Gilead farm. The netting above the trees provides protection fro full strength of sunlight. Guy took us on a short tour of the area around his tourist shelter, pulling down branches of various trees and shrubs planted there. We stood in the shade of some tall Frankincense trees, Boswellia sacra. There are twenty-two species of Boswellia. Experts, however, are certain that this one is the species used in the Biblical incense. It used to grow in the wild, in places like Somalia, Oman, and Yemen, but because of war and habitat destruction, it is disappearing. This farm is the only place in the world where it is being grown agriculturally. Without Guy’s thousand plants, Biblical frankincense is in danger of becoming extinct. “I’m not a religious person,” Guy points out. He covers his head only when working in the sun. When he started farming, he had no plans to observe the strictures of shmittah, the sabbatical year. During shmittah, planting and tending to crops is forbidden, The land is left alone to produce what it will. In the year before shmittah, farmers prepare the land for its “vacation.” Guy did not plan to observe shmittah. He had a farm and the plants needed care. Then, he changed his mind. He decided not to plant anything during the shmittah year. “It just seems like the right thing to do,” he said. The ingredients of the Biblical incense would be grown according to agricultural halakhah (Jewish law). For now, there is no market for Temple incense. The secret of how to make it, the proportions of the various herbs, even the exact identity of some of its ingredients, disappeared with the Temple’s destruction. To make the farm economically viable, Guy needs a market for his herbs and herbal products. Most of the plants he grows were used as medicines in the past. It is hard to find information on balsam, because what is marketed as balsam oil is not derived from Commiphora gileadensis. Rather, the oil is produced from several species of poplar trees, which have similar fragrances but not all the same constituents. True balsam (Biblical afarsimon) can be used to help heal wounds, as well as for cosmetics and perfumes. Frankincense can be used for colic and indigestions. It is recommended by some herbalist to treat acne, improve dental hygiene, deodorize spaces, and relieve stress. Additionally, it is an ingredient in some skin lotions. Myrrh is an anti-inflammatory resin, and beneficial for indigestion, ulcers, colds, cough, asthma, lung congestions, arthritis, and pain. It is also be applied topically for bedsores, wounds, abrasions, and boils. 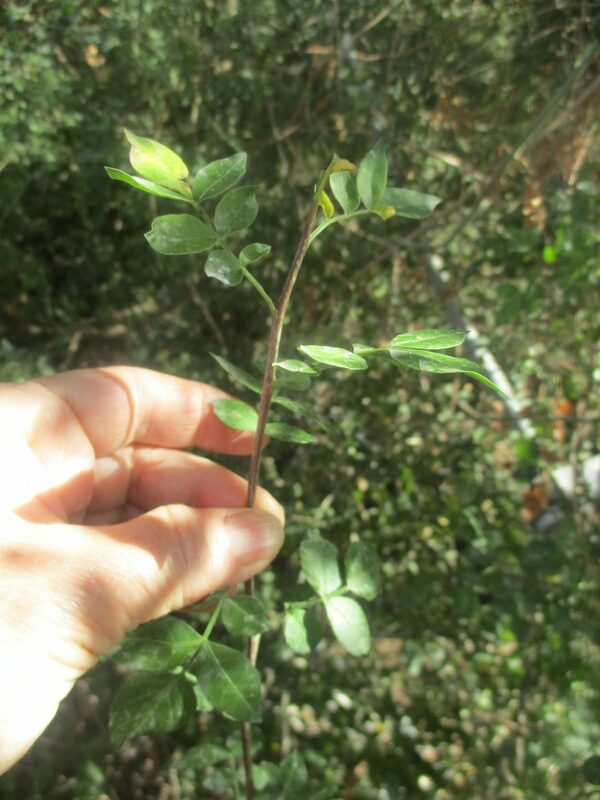 Cosmetically, it is used as an ingredient in perfumes and a preservative in cosmetics. Guy said several times that research is needed on all these herbs to determine how their pharmaceutical qualities can be put to best use. The Romans used many of the herbs in cosmetics and perfumes. He has developed a perfume and soap scented with balsam. After our tour, he displayed his products. The perfume oil has a pleasant light scent, and I bought a large (100 cc) bottle. When the Moshiach (Messiah) arrives, the Third Temple will be built. The Temple Institute will be ready to reinstate prescribed worship there, with everything needed for worship. The secrets of the incense will be revealed to the Cohanim and they will again make incense, from the herbs supplied by Guy Ehrlich. 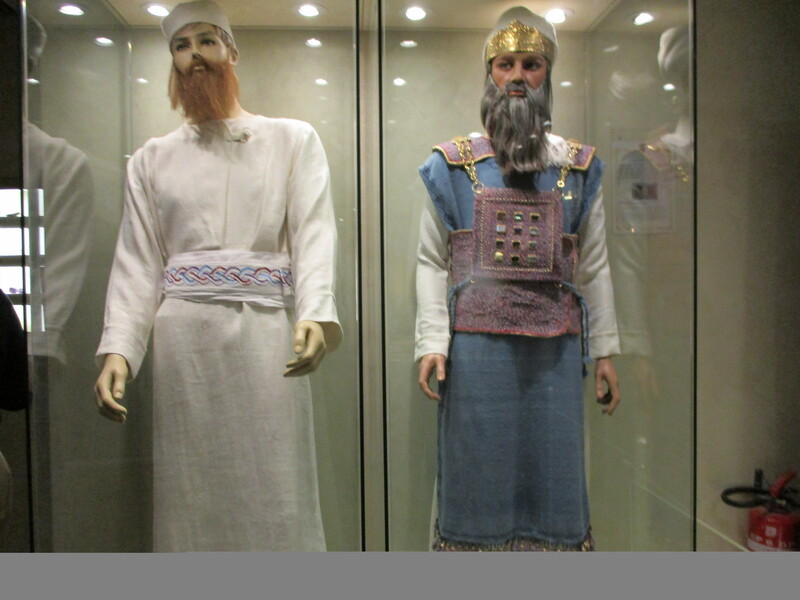 At the entrance to Machon HaMikdash, the Temple Institute, stands a statue of a Levite dressed in his work clothes—a white robe and head covering, red belt, and no shoes. He holds his long trumpet near his mouth, as if ready to provide the musical accompaniment to the next Psalm. As we entered the museum, several of us stopped to take pictures with him. It isn’t everyday you see a fully dressed Levite in the streets of Jerusalem. In 1967, Rabbi Yisrael Ariel was a paratrooper, one of the first to pray at the liberated Kotel, the Western Wall of the Temple Mount. He interpreted that experience as being the start of the Geula—the final redemption of the Jewish people that would be completed with the rebuilding of the Temple on Har Habayit, the Temple Mount. If temple worship was to be reinstated, appropriate instruments and utensils would be needed. He and a group of like-minded people began to study the Bible, Mishna, and Gemara for descriptions of how these were originally made and what they looked like. And then they set out to make them. It was a complicated process, requiring much study and interpretation of the original texts. Some of the details were argued over, back and forth among the scholars, until a final decision was made. And then they had to find craftsmen with the necessary skills to actually do the work. Many of Temple furnishings and tools were pure gold or silver. My Tour with Text class on the Second Temple period spent an hour at the Temple Institute this week viewing these objects and learning about the Temple’s operation. It’s one thing to read about the Temple service in the Bible or Talmud. It’s another thing entirely to see the pitchers and bowls and spice altar in front of you, exactly as they looked in the Temple over 1900 years ago. Every item in the museum is authentic, made to the original specifications. As we walked through the museum, we saw silver trumpets, gold pitchers for olive oil, the copper washing station, a gold incense altar. They are all ready to be used tomorrow should the Moshiach arrive today. All authentic, except for two things that Shulie Mishkin, our guide, would be careful to point out. 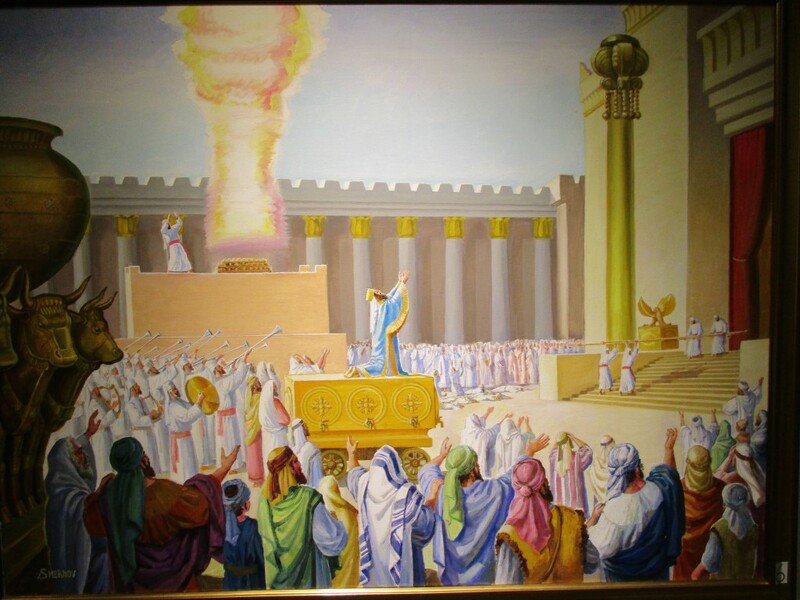 King Solomon inaugurating the First Temple in Jerusalem, as the ark is carried in by Levites. A large model of the Second Temple made of marble, copper, and gold, stands in the middle of the first room. It is surrounded of paintings depicting scenes in its history. The paintings are interesting because of their historical accuracy according to traditional commentators. They also show some creativity in their artistic interpretation of the events. It was easy to identify what each one depicted. One shows the tabernacle in the desert and at Shilo. King David dances in front of the ark as it enters into Jerusalem in another painting. A third shows King Solomon dedicating the Temple. I examined the clothes carefully. My father was a Cohen, as were his father and grandfather before him. Had I been a boy, I too would have been a Cohen, and worn these linen clothes to work. In those days before bleach and washing machines, how would we have kept those robes, hats, and sashes so white? Linen wrinkles easily—would our clothes ever have looked as neat as those on the mannequins? I wondered if the families were responsible for care of the priestly garments, or was there a special laundry on the Temple Mount. A related question came up when we entered the third room, the one devoted to the inner sanctuary, menorah, and the Holy of Holies. Here we saw models of two items: the menorah and the ark. The Temple Institute commissioned a Temple menorah, more than six feet tall made of 43 kilos of pure gold. It stands in a clear case on one of the landings of the long stairway leading from the Jewish Quarter down to the Kotel, where almost anyone who visits the Kotel can see it. front of the Holy of Holies. The Cohen Gadol, the High Priest, was the only person to ever walk into the Holy of Holies, which he did only on Yom Kippur. The Holy of Holies was a dangerous place; if the High Priest was not worthy of his office, he would die. There was a custom to tie a rope around the Cohen’s foot, so if he did die, the other priests would be able to pull him out. In the last years of the Second Temple, when the High Priesthood was often achieved by bribery or political machinations, this situation supposedly occurred regularly. Which raises the question: How did they clean the Holy of Holies? Jerusalem is on the edge of the desert and experiences regular dust storms in addition to its normal dusty condition. If you fail to clean your house for a week, you’ll notice the dust. If the dust settles on our bookcases so quickly even when the windows are closed, it surely was filtering into the Temple. And that’s in addition to the smoke of the incense the High Priest brought in on Yom Kippur, and perhaps spilled bits of the incense itself. Apparently, the holiness pertains only to the floor. If you could enter without walking through the doorway, you were safe. On the roof of the building were two trap doors. Young priests would sit on a platform that was lowered down into the Holy of Holies, and they would reach over and clean it. In the Temple as it was remodeled by Herod, the ceiling was very high. Cleaning it must have been a pretty scary job. In the last room, where groups can sit to discuss what they’ve learned of the past and the future, one last painting hangs on the wall. The rebuilt Temple looks just like the models of the Second Temple, and the city behind is full of large buildings. In the lower right corner, a tram pulls into the Temple light rail station. As we were leaving, a large group of boisterous five and six year olds came down the street and into the building. The Temple Institute is not only a museum, but an educational institution. It makes the Bible come alive. These school children were excited to be coming here to see it all as it was, and will be. These children, they already know.